The “Brexit” Charts 2/25a – 2/25e are available for download here. In the context of Brexit, the EU agencies presently located in the UK (i.e. the above-mentioned EMA as well as the EBA (European Banking Authority) will be relocated. If the CJEU requests an increase by three AGs (from eight to eleven), the Council (of Ministers) will, acting unanimously, agree on such an increase; Declaration No 38. In 2013, one additional AG was appointed and in 2015 two additional AGs ; Decision 2013/336. 750 additional members, elected by the peoples of all Member States in direct elections, based on a proportional representation system, for five years. There is no uniform election procedure yet (see Art. 223(1) TFEU). Europe of Nations and Freedom (new since 2015). • Must be citizens of EU Member States. Entire body must be approved, together with the president, by the European Parliament, which can reject candidates. Formal election by the European Council for a five year term. In the 2014-2019 Commission, there are 7 Vice Presidents, including a First Vice President. The Commissioners work in project teams, each of which is led by a Vice President. Formerly: Civil Service Tribunal (CST, formerly a panel of the CFI). Dissolved by September 2016; Regulation 2015/2422. To be determined by the Statute of the Court of Justice; at present 44 judges (May 2017); Regulation 2015/2422. · Art. 352 TFEU: “measures” in a general sense (compare however Chart 4/3, regarding proportionality). Not indicated, therefore to be decided by the institutions (compare however Chart 4/3, regarding proportionality). Casteels (2011): Art. 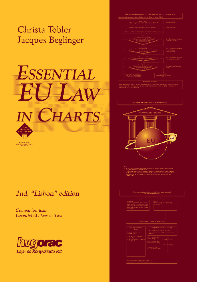 48 TFEU (legal basis provision; see Chart 8/48). Arts. 20 TFEU et seq. • Treaty on Stability, Coordination and Governance (TSCG, including the so-called “Fiscal Compact”; signed in March 2012 by 25 of the then 27 Member States; in force since 1 January 2013). The Convention is an instrument of the Council of Europe (see Chart 2/3). According to Art. 6(2) TEU, the EU shall accede to the ECHR; see also Protocol No 8; _ Opinion 2/13 on the draft accession agreement. • These rights are subject to derogations under Arts. 27: public policy, security and health; see Chart 7/22. • The Directive only applies to persons who have exercised free movement rights, Art. 3(1); McCarthy (2011). In Dassonville, the CJEU gave a very broad definition of the term “measures having an effect equivalent to quantitative restrictions on imports” (MEEQR) under Art. 34 TFEU. In Towing Trailers, the CJEU provided a more detailed definition of what an MEEQR is under Art. 34 TFEU. • Subsequently Directive 2004/38, Regulation 635/2006. For the children of migrating workers, see also Art. 10 of Regulation 492/2011 (educational, apprenticeship and vocational training courses). This element is a corollary to free movement; e.g. of goods or services; see already Luisi and Carbone (1984). But: subject to the special derogation grounds and grandfather clause in the Treaty chapter on capital and payments. • Ensuring the effective exercise of the victims’ right to full compensation. • A final decision of an NCA or a court finding an infringement of EU competition law cannot be called into question in a damages action relating to the same infringement (i.e. it can be used as prima facie evidence in a damages action). Generally, the Member States must observe the principles of equivalence and effectiveness (see Chart 12/3). The Recast Directive is part of the Commission’s effort to simplify the Union acquis; see the Better Regulation Package (2015), in particular the Communication “Better regulation for better results” (2015) and the Commission Staff Working Document “Regulatory Fitness and Performance Programme (REFIT): State of Play and Outlook” (2015). The Recast Directive replaces Directive 75/117 (equal pay), Directive 76/207 (employment and training), Directive 86/378 (occupational social security) and Directive 97/80 (burden of proof; this directive had been adopted based on Art. 2(2) of the former Social Agreement). Two or more common solutions from which the Member States may choose. E.g. Art. 9(1) of Directive 2014/40 concerning general health warnings on cigarette packages: either “Smoking kills – quit now” or “Smoking kills“. The whole of certain directives, e.g. Art. 7 of Directive 2004/113: Member States may introduce or maintain provisions which are more favourable to the protection of the principle of equal treatment between men and women than those laid down in this Directive. EU law specifically provides for direct and indirect actions that may be brought before the CJEU as well as for a number of arguments that may be used before both national courts and the CJEU. Note: Since 2015, the numbers of regulations are built in the same way as those of directives, namely first the year and then the number of the act within that year, e.g. “2015/478”. • Communication from the Commission to the European Parliament, the Council, the European Economic and Social Committee and the Committee of the Regions: EU Regulatory Fitness, COM(2012) 746 fin.